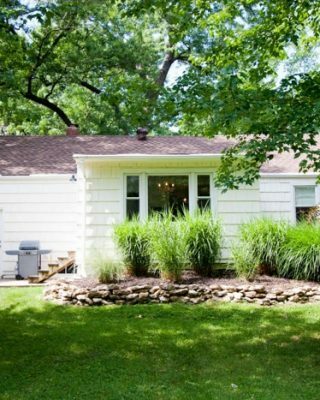 First of all, our home is anything but perfect, just ask anyone who stops by. It’s often chaotic, filled with three little girls, my husband Chris, our dog Dusty, my random projects and myself. I am frequently asked “how do you stay organized?” Well, in so many ways. I have shared about it from room to room, but thought I’d share it all here today. And, let’s be honest, it didn’t hurt to be pregnant twice in the last two years either! 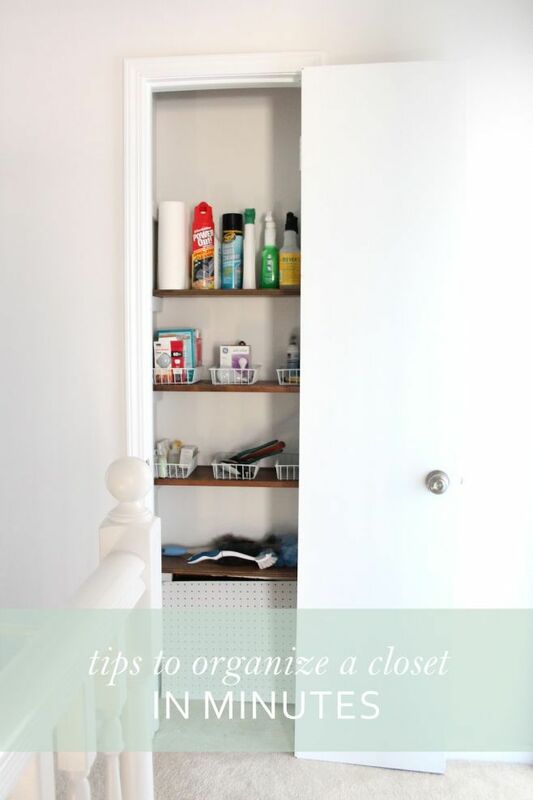 Here are my home organization tips that can be done in a few minutes or a nap time. Where to start? Mudroom? 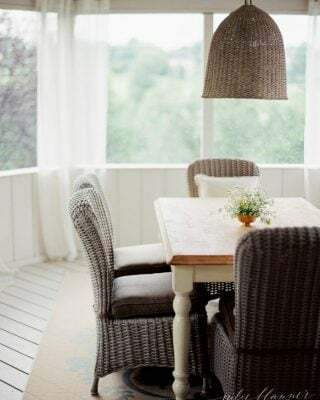 I need to take updated photos of this space to show you how it’s used, but it varies from season to season, which is what makes it work so well. In the Spring/Summer, you’ll find the baskets filled with baseball hats, sunscreen and bonnets. In Fall/Winter they’re filled with hats & gloves. This serves as our main coat closet. Having a landing spot is SO important for me…it keeps the otherwise tossed aside items in an organized manner. The girls’ shoes go in the basket below the bench. This room is also our laundry room, so there is a corner hamper and on a hidden hook in the mudroom side, a bag that holds our dry cleaning. 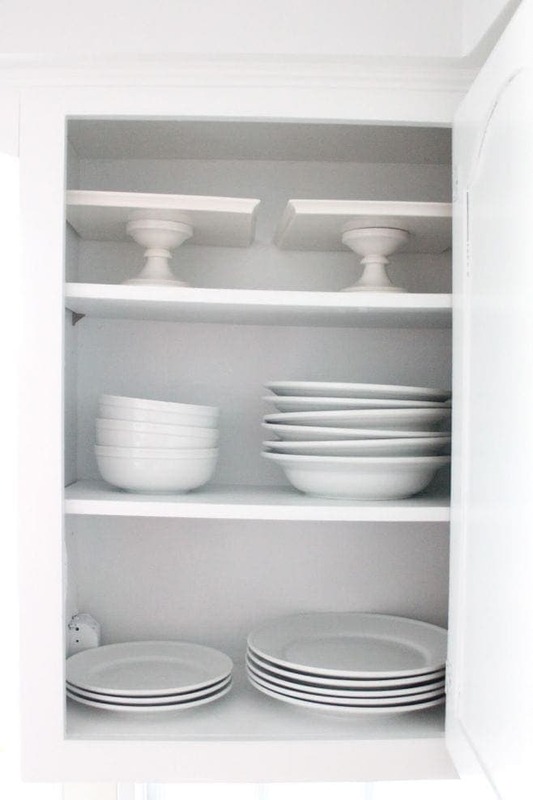 I’ve written several in-depth posts about kitchen organization that you’ll want to read. I have lots of simple storage solutions. In our living room, the built in bookcases hold puzzles, games, and dvd’s on one side and additional entertaining storage on the other. 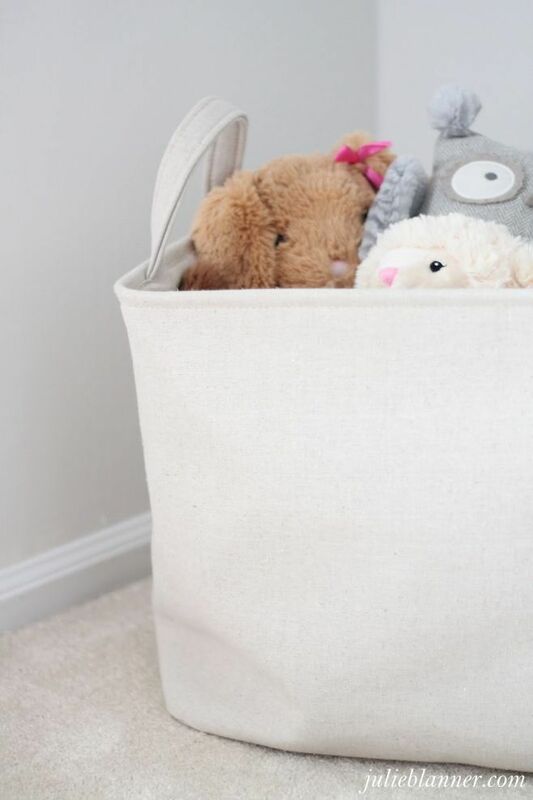 An oversized wicker basket keeps picking up toys simple for the girls and a basket on the coffee table/ottoman holds magazines. Adalyn likes to call the hearth room “the library” because the coffee table hosts the majority of her books. The end table is near the mudroom, so we use it to hold things like Isla’s blankets, car/stroller toys, etc. 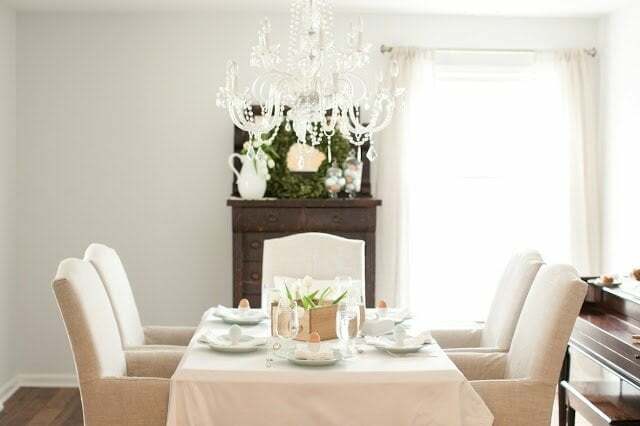 A family heirloom dresser holds our linen napkins, table cloths, candles, place card holders and other entertaining essentials. It also contains our favorite games like Rummikub, dominos, and Catchphrase for easy access after dinner. 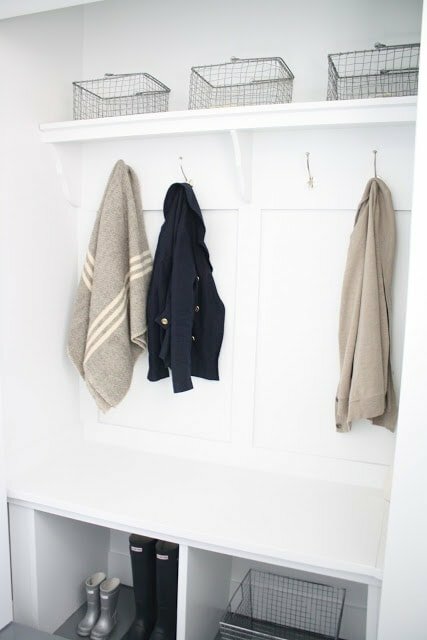 There’s also a small coat closet that holds our off season coats & jackets, vacuum, & broom. Upstairs, we’re fortunate to have 2 hall closets. One is filled with a few tools, cleaning supplies & travel essentials. The other hall closet is used as our linen closet. 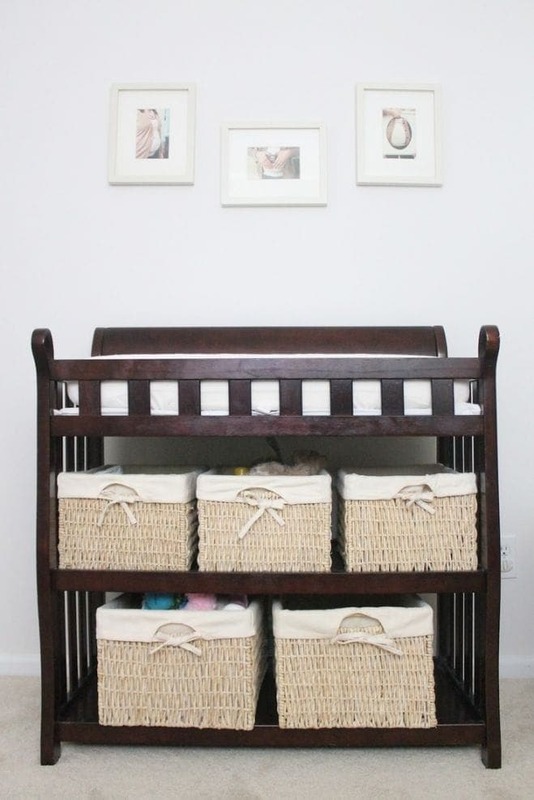 Baskets help contain unsightly folds and loose items. I’ve also created a dress up closet for Adalyn’s room and include baskets in their rooms so that they can help clean up. 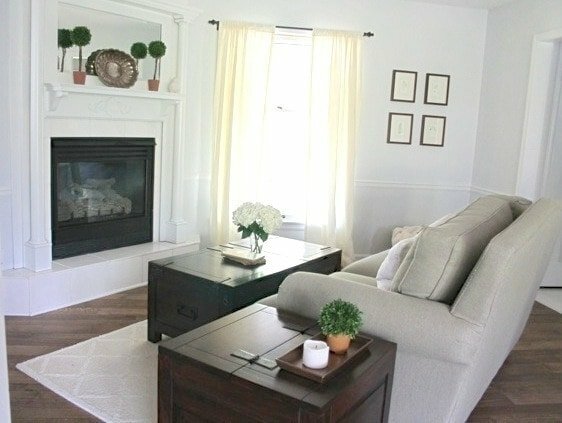 The other question I’m often asked is how do we keep our home so clean with “white” walls, carpet, etc. That’s a great post for another day that Isla and I put to the test on Thanksgiving. Happy organizing! 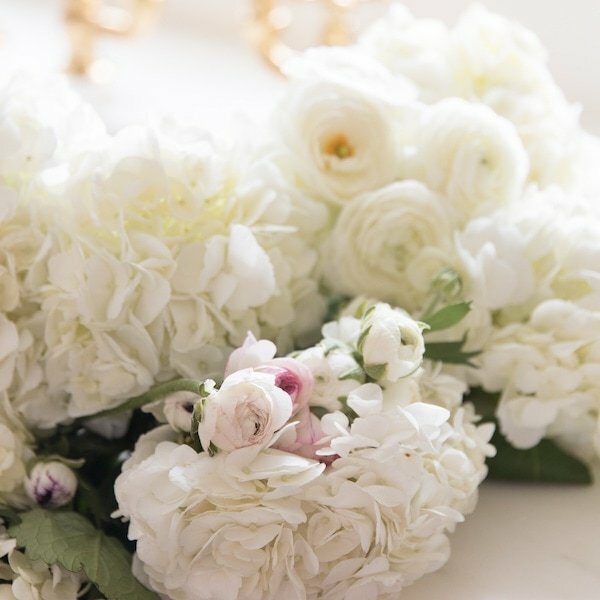 For more everyday ideas, follow me on Bloglovin and Facebook, pin with me on Pinterest and go behind the scenes on Instagram. Julie, I love this! always looking for innovative storage ideas. 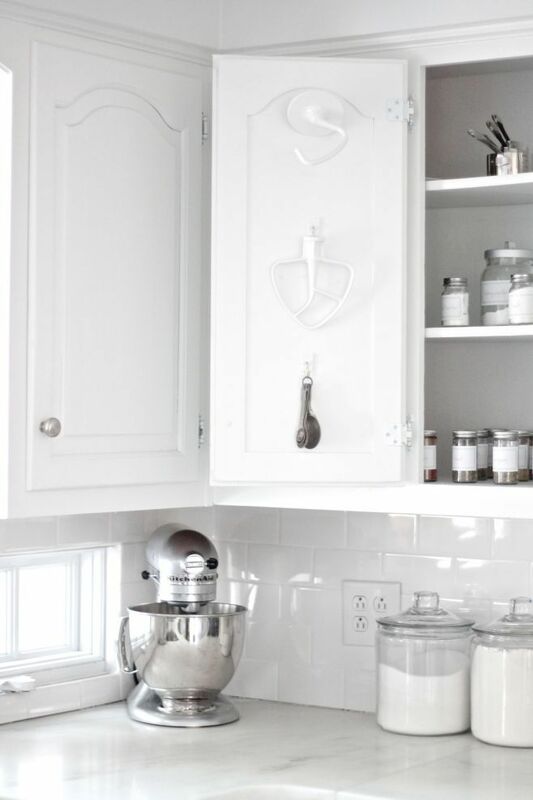 Especially the hooks on the back of the kitchen cabinets! 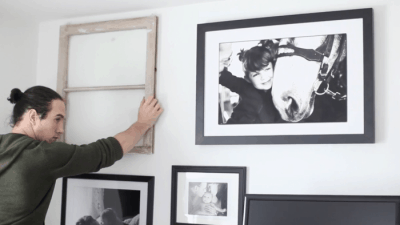 I would love to think that your house with two little ones really did look like the photos. I am a mother of 5 and I know better. I know it is important for the blog to make it look like a magazine, but I think for the sake of frustration of the other normal people out here in blog land,, it would be nice to be truthful. Reality is not bad, it is good. It makes us all feel like we are not missing the boat being able to be at the cross country event when the kitchen needed a little cleaning,, and at the Charity event for barrel riders when the living room still had the blankets that needed folding. Please leave the sets for Hollywood and show us life. If I am wrong, I am sorry, but this just does not ring true for most people I know. Thanks for your thoughts Denise! 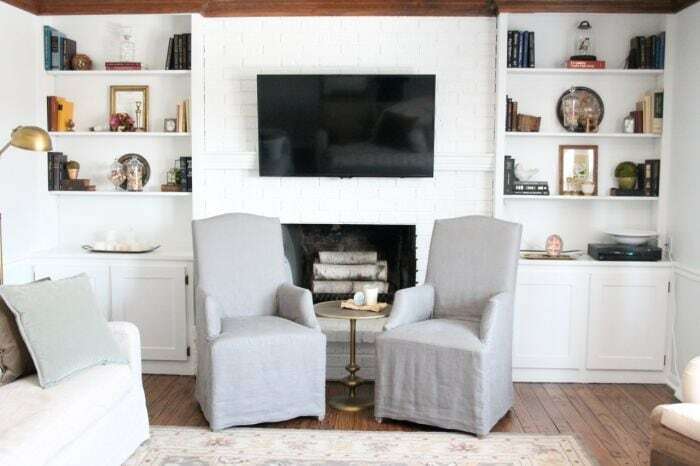 Honestly, you could walk into our home and most days it will look like that. I like to keep a tidy home, it’s inherent to my personality. However, you will rarely find our beds made, unless we’re expecting company. I look at a tour of our home as inviting you over, inviting you in, and therefore made the beds. 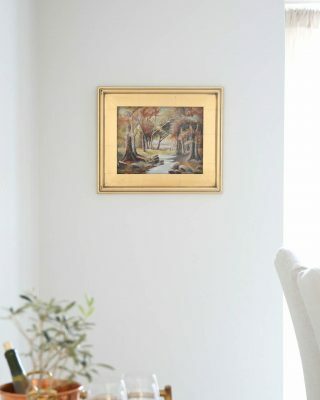 I wrote this post to share with others how I maintain an organized home and hope some have taken inspiration from it. It is never my intent to make anyone feel like they’re missing the boat. My life and my blog is all about making things simpler, so we can enjoy the moments that truly matter. I appreciate you taking the time to comment! 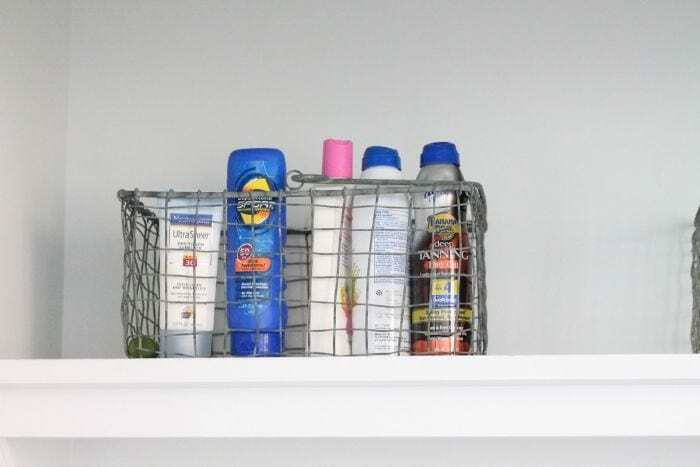 Love the wire baskets in the mudroom, great use! Great tips! Very specific and detailed to tackle all the things to clean the kitchen. I;m so relieved. I love it! 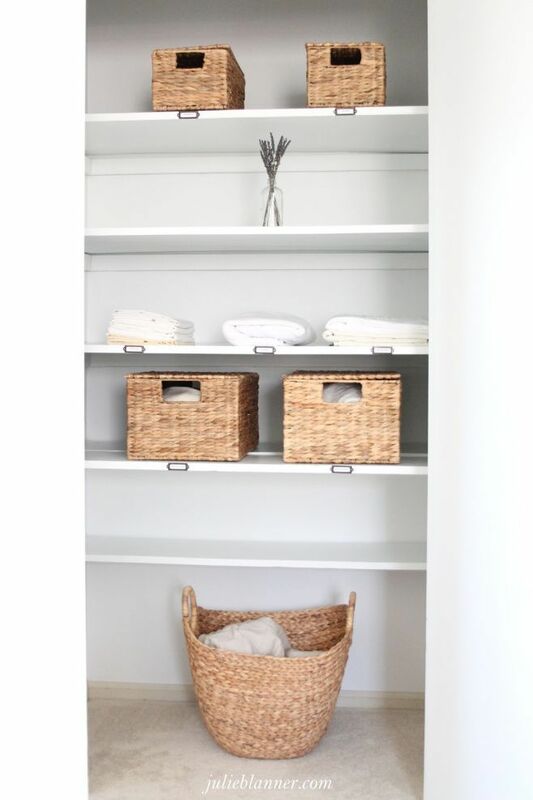 I’ve said it many times before, bins and baskets can drastically pretty up a room and also make it that much easier to organize. Lots of the projects I’ve done for myself and have taken on via clients have been successful because of this.